Ryan Fitzpatrick played well enough to retain starting the quarterback job in Tampa Bay for another week. 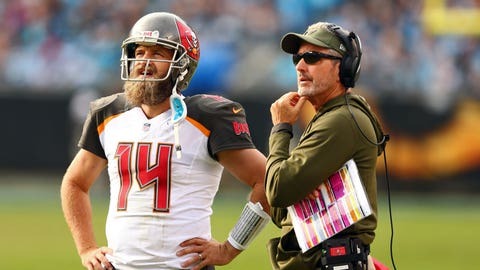 CHARLOTTE, N.C. (AP) — Ryan Fitzpatrick played well enough to retain starting the quarterback job in Tampa Bay for another week. Now if “Fitzmagic” can figure out how to keep the Buccaneers from digging themselves such a big hole early in games. Fitzpatrick replaced the struggling Jameis Winston and threw for 243 yards and four touchdowns, but it wasn’t nearly enough for the Buccaneers to overcome a 28-point first half deficit as they lost 42-28 to the Carolina Panthers on Sunday. Fitzpatrick threw two interceptions, including one in the first quarter to Eric Reid that led to Carolina’s first touchdown. That includes on defense, where the Bucs have gone five games this season without forcing a turnover. They haven’t had an interception since Week 3. “If you’re not getting any help, you better not be turning it over on offense,” Koetter said. Fitzpatrick didn’t get much help from his top receivers Mike Evans and DeSean Jackson, who were essentially non-factors. Evans was blanketed all day by cornerback James Bradberry and managed just one 16-yard reception on 10 targets. Jackson saw limited playing time and caught just two passes for 32 yards against rookie Donte Jackson, who intercepted Fitzpatrick on a downfield heave late in the fourth quarter to seal Carolina’s third straight win. It was slot receiver Adam Humphries and tight end O.J. Howard who did most of the damage. Humphries had eight catches for 82 yards and two touchdowns, while Howard hauled in four catches for 53 yards and two more scores. Despite the loss, Humphries said Fitzpatrick never gave up — and wouldn’t let his teammates, either. Tampa Bay hosts Washington next week and then visits the New York Giants, giving them a shot to get back to .500 on the season. “We know we have the talent. We can’t keep digging ourselves into these holes,” Fitzpatrick said. Fitzpatrick got the starting nod after Winston turned the ball over 11 times in the previous 3 ½ games after returning from a league-imposed three-game suspension. He nearly rallied the Bucs back last week against Cincinnati after replacing Winston, but the comeback fell short with the Bengals holding on for a 37-34 win.